Drosophila suzukii, commonly called the spotted-wing drosophila, is a vinegar fly—closely related to Drosophila melanogaster (the common vinegar fly). Native to southeast Asia, D. suzukii was first described in 1931 by Matsumura. Observed in Japan as early as 1916 by T. Kanzawa, D. suzukii was widely observed throughout parts of Japan, Korea, and China by the early 1930s. By the 1980s, the “fruit fly” with the spotted wings was seen in Hawaii. It first appeared in North America in central California in August 2008 and is now widespread throughout California's coastal counties. western Oregon, western Washington,, and parts of Florida. D. suzukii is a fruit crop pest and is a serious economic threat to soft summer fruit; i.e., cherries, blueberries, raspberries, peaches, nectarines, apricots, grapes, and others. A male "D. suzukii." Note the distinguishing dark spots near the tips of the wings. Like other members of the vinegar fly family, D. suzukii is small, approximately 2 to 3.5 mm in length and 5 to 6.5 mm in wingspan and looks like its fruit and vinegar fly relatives. It's body is yellow to brown with darker bands on the abdomen and it has red eyes. The male has a distinct dark spot near the tip of each wing; females do not have the spotted wing. The foreleg of the male sports dark bands on the first and second tarsi. The female has a long, sharp, serrated ovipositor. The larvae are small, white, and cylindrical reaching 3.5 mm in length. When first observed in a new region, D. suzukii has often been confused with the western cherry fruit fly (Rhagoletis indifferens) and was given the short-lasting name cherry vinegar fly. 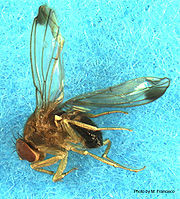 The cherry fruit fly is significantly larger than D. suzukii (up to 5 mm) and have a pattern of dark bands on their wings instead of the telltale spot of D. suzukii. The talltale spot on the wings of male D. suzukii have earned it the common name "spotted wing drosophila" (SWD). Unlike its vinegar fly relatives which are primarily attracted to rotting or fermented fruit, D. suzukii attacks fresh, ripe fruit by laying eggs under the soft skin. The larvae hatch and grow in the fruit, destroying the fruit's commercial value. The lifespan of D. suzukii varies greatly between generations; from a few weeks to ten months. Generations hatched early in the year have shorter lifespans than generations hatched after September. Research shows that many of the males and most of the females of the late-hatching generations overwinter in captivity--some living as long as 300 days. Only adults overwinter succesfully in the research conducted thus far. In Washington state, D. suzukii has been observed in association with two exotic and well-established species of blackberry, Rubus armeniacus (syn Rubus discolor) and Rubus laciniatus (the Himalayan and Evergreen Blackberries, respectively.). Adults emerge from overwintering when temperatures reach approximately 10 °C (268 degree days). The fertilized female searches for ripe fruit, lands on the fruit, inserts its serrated ovipositor to pierce the skin and deposits a clutch of 1 to 3 eggs per insertion. Females will oviposition on many fruits and in regions of scarce fruit, many females will oviposition on the same fruit. In captivity in Japan, research shows up to 13 generations of D. suzukii may hatch per season. A female may lay as many as 300 eggs during its lifespan. With as many as 13 generations per season, and the ability for the female to lay up to 300 eggs each, the potential population size of D. suzukii is huge. It is also important to note that males of D. suzukii become sterile at 30 °C and population size may be limited regions that reach that temperature. The larvae grow inside the fruit. The oviposition site is visible in cherries by a small pore scar in the skin of the fruit often called a "sting". After 1 or 2 days, the area around the "sting" softens and depresses creating an increasingly visible blemish. The depressions may also exude fluid which may attract infection by secondary bacterial and fungal pathogens. Pupae may leave the fruit, or remain inside it, to pupate. The economic impact of D. suzukii on west coast fruit crops is negative and significantly affects a wide variety of summer fruit in the United States including cherries, apples, blueberries, grapes, nectarines, pears, plums, pluots, peaches, raspberries, and strawberries over a very large geographical area (the coastal regions of western states). Yield loss estimates vary widely, with negligible loss in some areas to 80% loss in others depending on location and crop. Since so little research has been conducted in the affected regions, accurate estimates of damage done by D. suzukii are impossible to ensure, however the $500 million actual loss due to pest damage in 2008--the first year D. suzukii was observed in California--is likely to be a reliable indicator of future conditions. ↑ Bolda, M, Goodhue, R, Zalom. Spotted Wing Drosophila: Potential Economic Impact of Newly Established Pest. Giannini Foundation of Agricultural Economics, University of California. 2009. This page was last modified on 12 May 2010, at 14:51.